Time to talk numbers! B2B software and technology marketers keep track of crazy amounts of data, ranging from website traffic stats, to strategy ROI dollars and everything in between. With all of that data, what actually defines success? Over 100 tech marketers opened up to us in our 2019 State of the Industry Report to dish about how they’re reaching for the stars (and actually touching them). 66% of our respondents are hitting (or even exceeding) their primary KPI with the remainder saying they aren’t far off. That’s pretty impressive, despite software and tech marketers having a unique set of challenges. 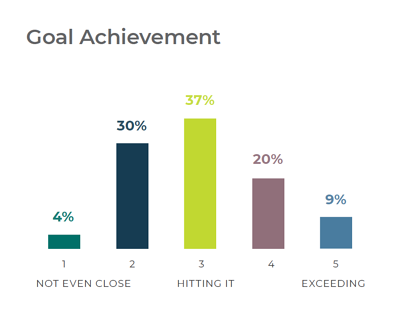 How are tech marketers measuring their success? Gone are the days of primarily focusing on top-of-funnel metrics. While bringing in leads, such as website traffic and impressions, will always fall on marketing’s shoulders, it’s not the target metric focused on today. 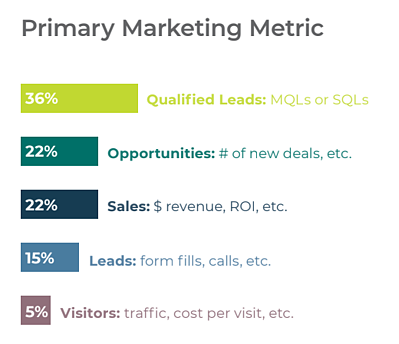 According to our survey, the majority of tech marketers (36%) measure their success via the number of qualified leads generated or the number of opportunities created (22%). What’s up with the focus change? Today, the idea of marketing as a revenue center is becoming the new norm. Tech companies are realizing the potential when focusing on MQLs and SQLs and it’s all thanks to inbound marketing ideology. 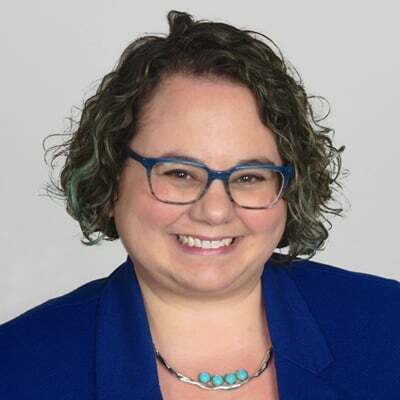 Inbound has armed marketers with the nurturing knowledge to not only draw leads in, but make them want to engage and connect with their brand. Just guess how many of our marketers are focusing on inbound for 2019…or download our full report to find out! How is this change to an inbound philosophy helping marketers get more qualified leads? Creating premium content gives your brand muscle. Case studies, white papers, and eBooks are just some of the types of meaty, relevant content B2B tech marketers are producing to nurture leads. These information-dense pieces do a lot of the heavy lifting for marketing teams by solidifying their company as an expert in the industry. This is why 75% of our respondents stated that they are taking the time to produce premium content with the goal to produce at least one per month. Want to get really crazy? Consider leaving some of your educational pieces ungated to maximize your interaction with shy leads who don’t want to fill out a form just yet. Nothing attracts like staying true to the user experience. Inbound is all about making leads feel warm and fuzzy, no matter where they are in the buying process. Establishing your brand as an industry thought leader with premium content is important but it’s also essential to demonstrate your dedication to the user experience. This means creating content for your buyer personas across the board and making it easy for them to interact with your brand. Your content can lead them through their journey from the beginning, before they even know who you are. Just realized they have a problem? Your blog about their industry challenges made them feel like they weren’t alone. Had an epiphany that your company could be the solution? A well-timed social media ad offering a free demo entices them to reach out. Is now a client and you want to keep them happy? Your product tips and updates e-newsletter keeps you at front of mind. The marketing industry is constantly evolving and the great thing about B2B software and tech marketers is their hunger for trends and their flexibility to stick and move. This willingness to morph and grow their strategies allows them to incorporate inbound methodologies with ease and bring in what every tech company really wants: qualified leads. Interested in learning more about how inbound marketing can help you meet your goals? Check out the B2B Tech Marketer’s Guide to Inbound.